Bands of Mercy were formal organizations that brought young boys and girls together under the umbrella of being kind to animals. Humane Education was a central component of Band of Mercy activities. The history of the Band of Mercy movement dates back to 1875, when Catherine Smithies formed the first one in Britain. In 1879 the Band of Mercy Advocate began as a periodical publication in Britain. The Royal Society for the Prevention of Cruelty to Animals (RSPCA) took over the organization of both the Bands of Mercy and its related publication in 1882. 1882 also marked the year when the Band of Mercy movement came to North America. George T. Angell, founder of the Massachusetts Society for the Prevention of Cruelty to Animals (MSPCA) teamed up with Rev. Thomas Timmins to start Bands of Mercy in the United States. This movement grew rapidly–by the early 20th century there were more than 27,000 Bands of Mercy in the United States. 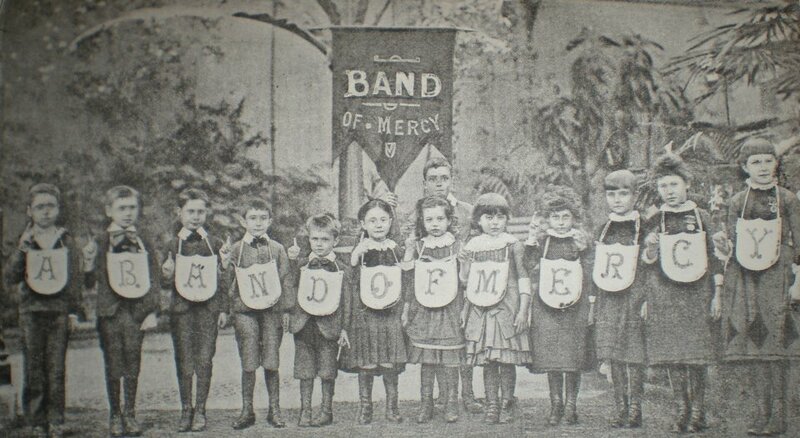 Bands of Mercy had regular meetings at which members would recite stories and sing songs that were specially written and compiled for these events. Lessons on kindness towards all species were given at these meetings, often accompanied by lantern slides. Members in Bands of Mercy took the following pledge, which was also recited at meetings and printed on Band of Mercy literature. While there was a lot of uniformity between the activities of the various Bands of Mercy, each did take on a unique local feel. Perhaps one of the most unique of these was the Beautiful Jim Key Band of Mercy, an offshoot of the Beautiful Jim Key travelling show. Beautiful Jim Key was a horse who was known for his extraordinary talents, including writing, reading, spelling, and telling time. Under the guidance of Dr. William Key, a former slave who became a veterinarian, and promotor A.R. Rogers, Beautiful Jim Key performed across the United States in the late 19th- and early 20th-centuries. In addition to showcasing the abilities of this horse, these shows brought a message of kindness and compassion towards all creatures. The Beautiful Jim Key Band of Mercy was part of this. By the 1930s these groups were more frequently known as Junior Humane Leagues. 1913 American Humane Education Society Pamphlet. Cover of 1910 Band of Mercy Songbook. Collection of MSPCA Angell. American Band of Mercy membership card c.1918. Collection of MSPCA Angell.